“The communist state attempted to launch an unidentified missile from the port city of Sinpo on its east coast in the morning and the launch is presumed to have failed,” the South Korean military said, according to Yonhap news. The attempted missile launch has also been detected by the US military, which said it “blew up almost immediately” after the launch at 9:21pm GMT. While the assessment is still ongoing, two US officials told Reuters there’s a “high degree of confidence” the projectile was a land-based but not an intercontinental ballistic missile. Meanwhile, Seoul officials told Yonhap that the failed missile launched on Sunday resembled the type of a projectile the North fired earlier this month. 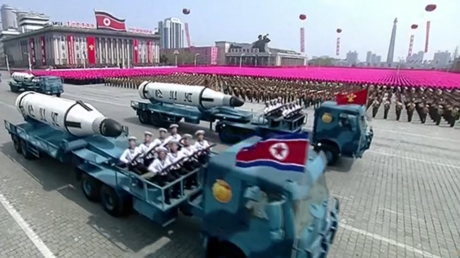 On April 5, Pyongyang triggered what is believed to be a KN-15 medium-range ballistic missile. Also fired from the Sinpo area, it flew some 60 kilometers before falling into the Sea of Japan. Reports of the failed launch came just hours before US Vice-President Mike Pence’s scheduled arrival in South Korea; to begin his Asian tour offering security reassurances to its allies in the region. Pence has already been briefed on the latest developments while en route to the Peninsula, White House aides told reporters on board the plane. The vice president then discussed the missile launch with Donald Trump. Later, a White House foreign policy adviser travelling with Pence commented on the launch, saying that it did not catch Washington by surprise. Defense Secretary Jim Mattis said in a statement that Trump and his military team are aware of North Korea's missile launch. The US president has yet to comment on the matter. On Saturday, as North Korea marked the 105th birth anniversary of its founding leader Kim Il-sung with a military parade in Pyongyang, the North for the first time publicly showcased its submarine-launched ballistic missiles (SLBMs), as well as what appears to be a new type of ICBM. "It's presumed to be a new ICBM. 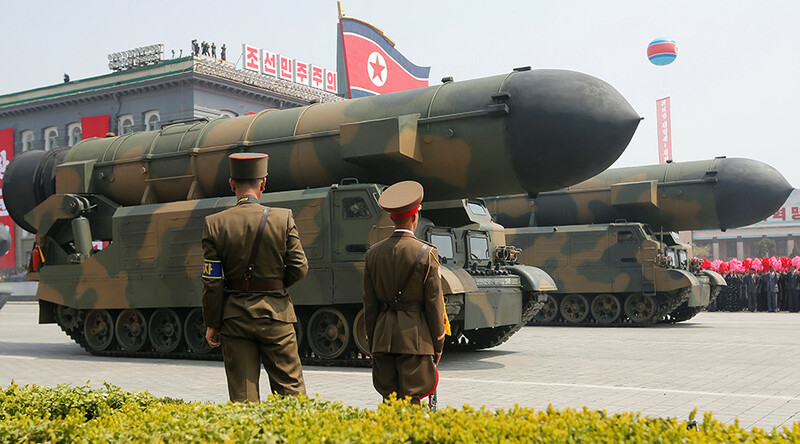 It seems longer than the existing KN-08 or KN-14 ICBMs," a South Korean military official told Yonhap, after the intercontinental ballistic missiles along with the Pukkuksong-2 SLBMs were paraded in front of the country's leader, Kim Jong-un. Choe Ryong Hae – a close aide to Kim Jung-un, during his address to the soldiers – warned against any US provocations on the Peninsula, after US President Donald Trump repeatedly promised to “take care” of the North Korean issue over the past weeks. “If the United States wages reckless provocation against us, our revolutionary power will instantly counter with annihilating strike, and we will respond to full-out war with full-out war and to nuclear war with our style of nuclear strike warfare,” Choe said. "North Korea showing a variety of offensive missiles at yesterday's military parade and daring to fire a ballistic missile today is a show of force that threatens the whole world," South Korea's Foreign Ministry said in a statement on Sunday. Tensions on the Korean Peninsula has reached worrying heights amid concerns, fueled by media reports, that Pyongyang might be preparing new nuclear and ballistic missile tests – and that the US might decide to act unilaterally and conduct a pre-emptive or retaliatory strikes, just as it did against Syria on April 7.